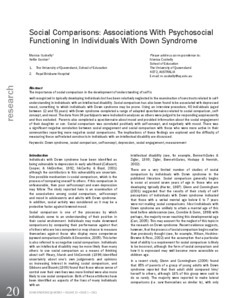 The importance of social comparison in the development of understanding of self is well recognized in typically developing individuals but has been relatively neglected in the examination of constructs related to selfunderstanding in individuals with an intellectual disability. Social comparison has also been found to be associated with depressed mood, something to which individuals with Down syndrome may be prone. Using an interview procedure, 40 individuals (aged between 12 and 51 years) with Down syndrome completed a range of adapted questionnaires related to social comparison, selfconcept, and mood. The data from 34 participants were included in analyses as others were judged to be responding acquiescently and thus excluded. Parents also completed a questionnaire about mood and provided information about the social engagement of their daughter or son. Social comparison was correlated positively with self-concept, and negatively with mood. There was a signifi cant negative correlation between social engagement and social comparison with those who were more active in their communities reporting more negative social comparisons. The implications of these fi ndings are explored and the diffi culty of measuring these self-related constructs in individuals with an intellectual disability are discussed.